Judging by the way these leaks are intensifying, the HTC One mini 2 might not retain its unofficial status for much longer. The upcoming compact premium smartphone has made the news once more thanks to popular source of leaks evleaks. Mr Blass has used his Twitter account to post a press photo of the HTC One mini 2, showing the smartphone in three different colors. 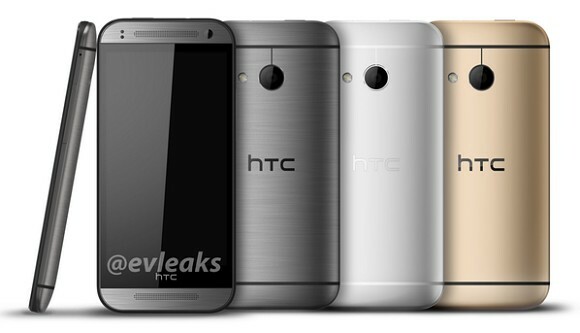 Gray, silver and gold match the trio of versions that the HTC One (M8) had at launch. The design of the new mini smartphone sticks very close to its full-sized siblings too. Unfortunately, the leak brought no news on the specs of the device. It does show that the One mini 2 lacks a second camera as previously reported, but we got nothing on the chipset, the screen or at least the camera sensors of the device. We are hoping HTC will announce the smartphone soon and shed more light on the matter. No No Sony Xperia Z1 compact is the best one! Yes my ahead of its time One S with S4 still rocks. not changing till something more powerful in HTC comes out at the same size..
'The compact premuim smartphone' gsmarena totally insult the smartphone industry.